the tab itself, but not if you navigate with the next button. Is this a CSS issue? I was able to see this issue on the default Form Tabs widget. 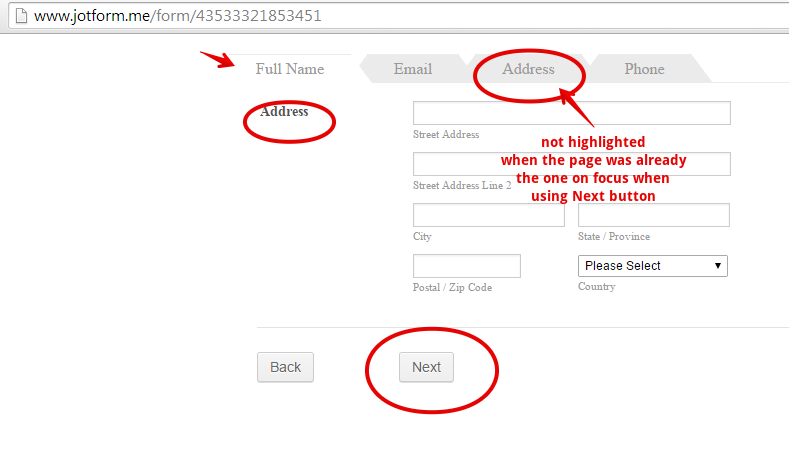 The focused or selected tab is not highlighted when using only the Next button of the multiple page form. I have raised a bug ticket report to our higher team support so that it can be investigated asap. We will let you know once we have update on the status. The issue is now fixed - Active tab and page navigation are now accurately synced. We apologize for the inconvenience this caused you. If you experience further challenges - please let us know.